The word "dinosaur" is commonly used to describe a group of amniotes that lived on Earth from about 230 million years ago to about 65 million years ago. The Linnaean classification system classifies dinosaurs as reptiles. "Dinosaur" is Greek for "terrible lizard". According to the system of animal classification known as cladistics, the clade Dinosauria consists of the extinct dinosaurs, as well as modern birds. Therefore, birds are a kind of dinosaur. A clade is a group of organisms that share a common ancestor. All of the descendants of this common ancestor belong to the clade. There is no clade that includes only extinct dinosaurs but excludes birds. Some groups of extinct dinosaurs were more closely related to modern birds than they were to other groups of extinct dinosaurs. The terms avian dinosaur and non-avian dinosaur are sometimes used to distinguish between birds and other members of the Dinosauria. Dinosaurs, birds, crocodilians (alligators, crocodiles, caimans, gharials and false gharials), squamates (snakes and lizards) and tuataras are diapsids. A diapsid is an amniote that has two temporal fenestrae (holes) on each side of its skull or is descended from an amniote that had two temporal fenestrae on each side of its skull. The Dinosauria (birds and dinosaurs), the crocodilians and some other animals that are now extinct, including flying animals known as pterosaurs, make up the clade Archosauria within the diapsids. a fourth trochanter - a ridge on the thighbone to which the tail muscles are attached. 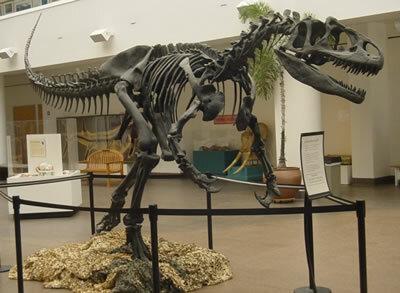 The Dinosauria are archosaurs that had (or have) an erect gait, with legs that move back and forth directly underneath their torsos when they walk. In comparison, crocodiles have legs that are sprawled out alongside their torsos. Mammals also have an erect gait that evolved independently from the gait of dinosaurs. During the 165 million years that non-avian dinosaurs lived on Earth, they diverged into many different species with diverse characteristics. Non-avian dinosaurs varied in size. Some weighed over 50 tons, while others weighed less than a pound. Some walked on four legs, while others walked on two legs. There were carnivorous, herbivorous and omnivorous species. Non-avian dinosaurs were probably warm-blooded. They laid eggs. Many non-avian dinosaur species built nests and cared for their young, like crocodilians and modern birds. Dinosaurs may be divided between two main groups, the ornithischians and the saurischians. "Ornithischian" means "bird-hipped" and "saurischian" means "lizard-hipped". Modern birds are saurischians - lizard-hipped dinosaurs - rather than ornithischians - bird-hipped dinosaurs. Ornithischians had a pelvic structure similar to those of modern birds. That's how they got their name. However, this structure evolved independently in ornithischians and in birds. Some walked on two legs and some walked on four legs. Stegosaurus, Ankylosaurus and Triceratops were ornithischians. The saurischians are divided between two clades, the sauropodomorphs and the theropods. The sauropodomorphs were herbivorous dinosaurs. They had long necks and walked on four legs. Allosaurus, Tyrannosaurus, Velociraptor and Oviraptor were theropods, as are modern birds. Theropods walked (or walk) on two legs. They were (or are) either carnivorous or descended from theropods that were carnivorous. The last of the non-avian dinosaurs become extinct about 65 million years ago, along with many other species of animals and plants, during what is known as the Cretaceous-Tertiary extinction event, or the K-T extinction event. This mass extinction was probably caused by an asteroid crashing into Yucatán peninsula in what is now Mexico. This asteroid would have formed Chicxulub Crater, which is about 110 miles in diameter. The impact would have prevented a large amount of sunlight from reaching the Earth, preventing plants from obtaining energy through the process of photosynthesis. This would have caused many plant species to have become extinct. The animals that ate those plants, and the animals that preyed on those herbivores, would have become extinct as well.